The exiting facility can be upgraded sooner, Kerouac said, and a new facility will require money the county doesn’t currently have. In the meantime, Kerouac said he will ask the Board for an amendment to its current budget to move operation funds to make improvements to the existing facility to address flooding. At the work session, held at Oconee Veterans Park on Jan. 9, Kerouac did not specify a date for the Board decision. He told me in an email on Thursday that, while he doesn’t have a specific date for Board action, he would like the decision to be made this spring. Catlyn Vickers, director of the Animal Services Department, also told the Animal Services Advisory Board at its meeting on Jan. 10 that she is expecting the decision to be made this spring. Vickers also told the Advisory Board that she expected action soon on the problems of flooding and internal maintenance issues at the Shelter. Kirouac said in his email to me that, as far as he knew, the county has not received any additional materials from Terry Tevis, of Tevis Architects, regarding Tevis’ evaluation of the Animal Shelter. The county hired Tevis Architects for $10,000 in September of 2016 to do an assessment of the Oconee County Animal Shelter. Tevis, who has offices in Atlanta, recommended that the county replace the existing facility at a cost of $2.9 million, excluding the cost of land for such a facility. When Tevis gave his report to the Board of Commissioners in February of 2017, Chair John Daniell pointed out errors in the report and asked for additional information from Tevis, which Tevis promised to provide. “There's no update to my knowledge on the report at this point,” Kirouac said in his email to me last week. Jeff Benko, who preceded Kirouac as county administrator, told the Animal Services Board last July that the county will need to hire a new consultant to help it decide what to do with the Animal Shelter. Benko said the county has paid Tevis the $10,000 for his work. The money came from the county’s Special Purpose Local Option Sales Tax, and the most recent report on SPLOST spending shows the $10,000 disbursement in the Fiscal Year ending June 30, 2017. The 2015 SPLOST contains $750,000 for “Animal Control Facilities,” but the county anticipates collecting only in the neighborhood of 80 percent of that amount, or about $600,000. Kirouac told the Board of Commissioners at the Jan. 9 meeting that a new facility cannot be built for the amount in the current SPLOST. Funding for a new facility would have to come from a future SPLOST, he said. The 2015 SPLOST runs through 2022. “There are some significant maintenance issues with the existing facility that we’re going to undertake regardless of the long-term decision,” Kirouac said. The BOC work session on Jan. 9 was used to give Kirouac an opportunity to review goal set by the Commission as 2017 began. Kirouac said the county staff is going to launch a strategic plan this year, which he will bring back to the Board for action. He said he wanted feedback on the work completed in 2017. Kirouac said the community is “really excited” about rails to trails, which came up last year, but he called it a “long term” project. The undertaking will be part of a larger effort to create alternative transportation interconnectivity in the county, he said. Kirouac told the Board that the county will launch its county-wide transportation plan at the end of the month. The Georgia Department of Transportation is entering into a $215,082 consultant contract with HNTB Corporation of Atlanta to provide a multi-modal transportation study for Oconee County. HNTB will document and evaluate the exiting transportation system of the county and recommend needed improvements. Abe Abouhamdan, chair of the Citizen Advisory Committee for Land Use and Transportation Planning, told fellow Committee members that same evening that he knew nothing about the study. 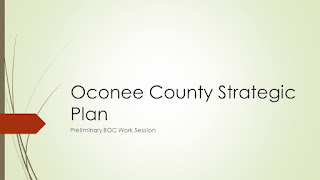 The video of that meeting, which meandered from topic to topic, is available on the Land Use and Transportation Planning Committee channel of the Oconee County Observations Vimeo site. At the end of the BOC work session on Jan. 9, Kirouac laid out four Strategic Goals for the county. 1. Smart Government: Provide services with efficiency, effectiveness, citizen engagement and transparency. 2. Smart Growth: Growth that fits Oconee County. 3. Smart Infrastructure: Develop far-sighted infrastructure improvements that meet the county’s needs now, and going forward. 4. Quality of Life: Cultivate Oconee County’s excellent quality of life . 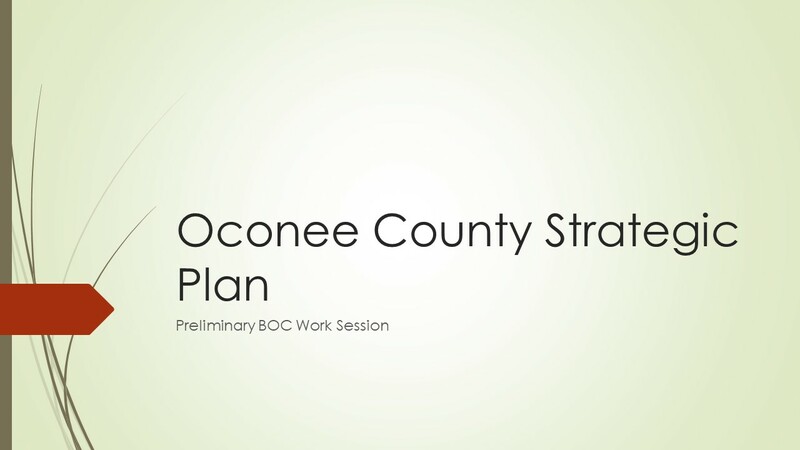 The first video below is from the Jan. 9 Board of Commissioners work session. Kirouac made his mention of Animal Services at 13:19 in the video. He made his comments on Vision and Strategic goals starting at 21:56. Because the PowerPoint Kirouac used is hard to see in the video, I obtained a copy from Kirouac and have uploaded a PDF version to the Box.Net site of Oconee County Observations. OCO: BOC Work Session 1 9 18 from Lee Becker on Vimeo. The second video below is from the Jan. 10 meeting of the Animal Services Advisory Board. I was not able to attend that meeting, but Penny Mills did attend and recorded the video. The discussion of the shelter starts at 1:45 in the video. Most of the brief meeting of the Animal Services Board was turned over to an appeal by Michael Allen Creech, 149 Hillsboro Road in North High Shoals, who is asking the Animal Services Advisory Board to overturn a classification of his dog as a public threat by Animal Services staff. OCO: Animal Services Advisory Board Meeting 1 10 18 from Lee Becker on Vimeo. It's too bad the county paid Mr. Tevis his $10,000 even though his report was very poor and he never responded to the questions. He took his money and left. Always a risk with consultants, but it seems like you could write a contract, providing a percent of the funds at strategic intervals with full funding contingent on an acceptable report. The consultant was hired to say we need a brand new building. So he did do what he was paid to do. Unfortunately for him, the facts do not back that recommendation. I am glad people are paying attention and blindly accepting consultants.